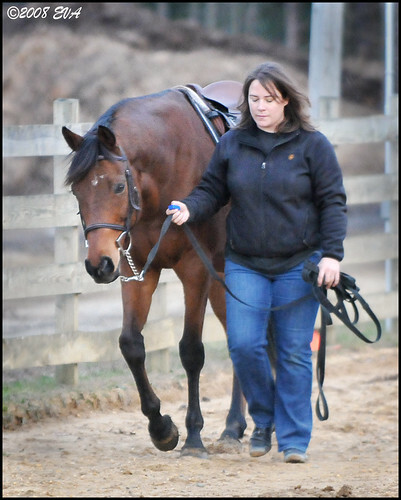 12/4/2008: Arrived at the barn when the horses were being brought in for feeding. While I do feel guilty making horses work at mealtimes, it’s a necessary part of their training. 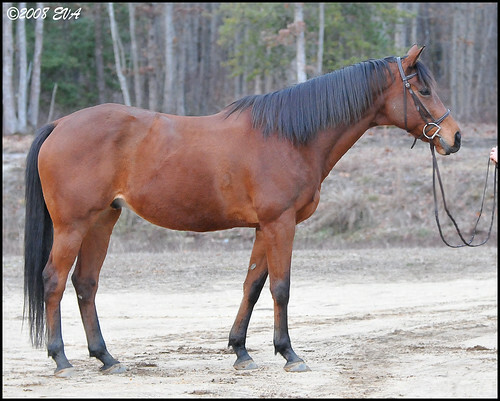 Wizard is not a particularly barn-sour or herd-bound horse, which is refreshing. He seemed a little surprised when the grain cart passed him on the crossties, but he did not show any frustration. Wizard is getting better about grooming. There is far less sensitivity around his poll and he lets me play with his mane without getting as concerned as he used to. He is still ticklish and he prefers soft brushes, but I need to get the dirt off of him, especially since he is unblanketed. 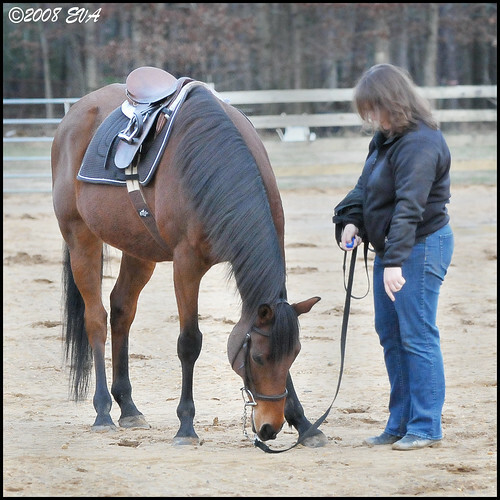 After tacking up, we went into the outdoor arena walked a few laps in hand, and then worked on clicker training. During Session 16, I taught Wizard how to put his head down. Today, he remembered his new trick after two attempts. Clever boy! After our short clicker session, I asked Wizard to move forward in each direction on the leadline in preparation for longeing. Then we longed to the left. Since Wizard does not know his verbal gait commands (walk, trot, canter, halt) yet, I usually ask for a walk but allow him to trot if he chooses to trot. He picked up a trot right away and longed like a pro! I asked him a halt after a few rotations and changed directions. For the past 3 or so sessions, he has been far more willing to go to the right. But those sessions were indoors at night with no distractions. Today was a bigger challenge. And he was not ready for it. Wizard balked several times when I asked him to longe to the right. He broke into a nervous canter and then stopped dead and faced me. When he faces me, it is difficult to get him going again since I cannot point the whip at his hip for that forward movement that I need. I am not sure if he was trained to face a person like Parelli horses or if this is just something he does when he’s insecure. Each time, he’s move forward for a quarter of the circle and then slam on the brakes and face me. If I did nothing, he’d just stand there. I would walk to his side, disengage his hind end, and when he was moving forward, I’d position myself at his hip to drive him forward, but he was too quick each time and would screech on the brakes. In order to get SOME sort of forward movement, I led him at a walk on his right side in a circle as if he was longeing. He was insecure and kept walking behind me. We went into the indoor arena to try a change in scenery and hopefully make the session less distracting, but he did the same thing indoors. The door to the arena was wide open and he stopped each time he got to the door. I walked him in hand to the right on his right side again and he again walked behind me. Once I had forward movement, I called it a day. There was no point in stressing him or confusing him further. He would volunteer a trot to the left, so I really don’t know if it’s a physical issue or a mental issue. We left the indoor arena and did more in-hand walking around the property to finish our session. He was more than happy to walk with me, walk over poles, and do circles in each direction. He felt less stiff than he has felt in the past few sessions. I’m totally baffled. I hand-grazed him, brushed him quickly, and wormed him with Ivermectin dewormer. All the while, he was in a good mood and quite affectionate. I’m not sure what to think. Will he listen better when his feet are rebalanced? Is it a bad habit? 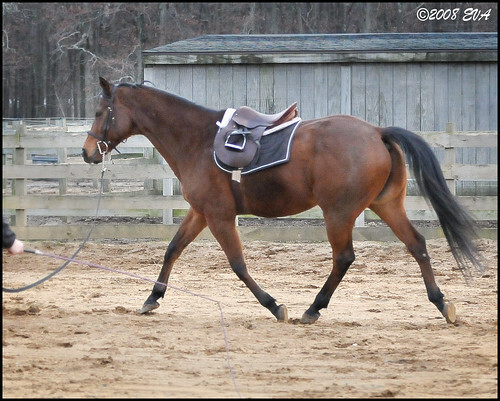 I hate the idea of side reins on a green horse so I’d like to avoid them if possible- I feel like they would just close “the door” a little on his forward movement. For now, my plan is to go back (AGAIN) and work on him moving forward every time I ask. I’m thinking of trying a longeing cavesson so he’s not pivoting on bit pressure. He looked more comfortable today than he has looked in a while so I’m really not sure if anything is bothering him. He was not spooky at all and was his usual mellow self whenever he was not rushing and spinning on the right. I love that first photo. Were you shooting while you were lunging, or was your mom on the case? Clinton Anderson will use his whip at the shoulder of a horse who gets stuck and I find this works well to get them moving. Just a thought. Thanks! No, my mom was shooting while I longed him. Thanks for the tip about the shoulder. The biggest problem is that when he faces me, he also crowds me and there’s no place to go forward except for on top of me! So I have to keep pivoting him to get him back in the right direction. I think I have to back to the basics again and get him to respond every time when I ask for forward movement. Thank you so much for reading and contributing to my blog, BTW! I appreciate your comments. Is he getting any supplements? I had Jessie on Smartcalm Ultra (basically a magnesium supplement) and it did wonders for his concentration. 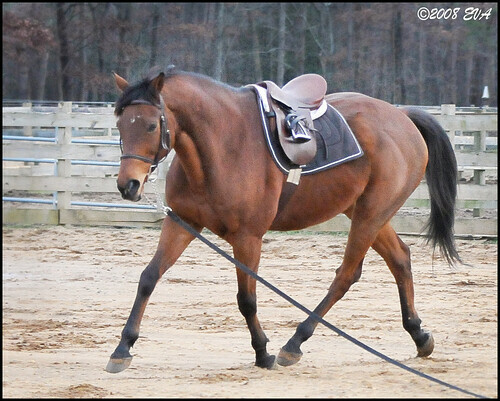 He was ok under saddle, but nuts when alone in the barn, even if I was tacking him up. He “worried” less when on the supplement. Something like that might help Wizard. It didn’t do anything for Sophie and her concentration, I think that was just a lack of training, though she did improve rapidly once I started her on Raspberry Leaves, it was like magic. She started improving twice as fast as she was before the Raspberry Leaves. Due to his longeing issues, I would just free longe him right now. Teach him the body language off the longe, where you don’t have to worry about him getting tangled up. I did this with Jake in the indoor arena, and it worked great. We started out with large figure eights, and then circles. 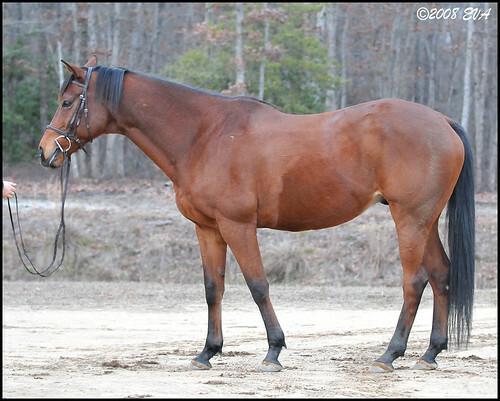 By the time he left for his new home I could get him to trot tight circles around me by positioning my body correctly. I want to teach Sophie to free longe, since she has no clue right now. 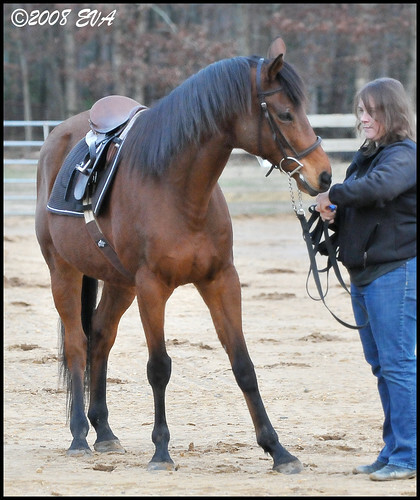 It would give you a chance to teach him forward and his gait commands without having the added stress of being on a line. Jake had trouble longeing, due to his balance issues, the free longeing let him have as much room as he needed to trot or get up to a canter. Plus it’s fun to play with inside/outside turns, and you can do as much of it at the walk as you want, so that you aren’t just tiring the horse out, but also training it. He is a super handsome boy though, stunning. I love how his mane is so black it looks blue. And Craig and I always have to say “to the left, to the left” whenever one of us is talking about something that is *actually* to the left. Forgot to say, I think a cavesson would be good. That way you can give him corrections through the longeline, I found it really helped Sophie to give her a rebalancing “half halt” with the line when she got rushy, or broke into the canter when I was asking her to extend the trot. Or when she looked at something outside, I could get her attention back in a way she understood and responded to. Dangerouspenguin beat me to it, but I also wanted to say that the first picture is really breathtaking. A beautiful horse, in motion, framed perfectly! Thanks for the comments and suggestions, everybody! Stephanie: Interestingly, Wizard was on raspberry leaves a few years ago. I had no idea they gave it to geldings. They said it calmed him quite a bit. When he was doing barrels, he was a major handful. Now I need to do some reading on raspberry leaves! Such interesting stuff I’m learning these days. I hope to try free longeing one of these days. Maybe Monday night.